Made in the 1970-80's, these Pilgrim candle lights are probably their largest (8" tall). Metal candle inserts are included. Please note that one aha a vertical optic and the other has a slightly twisted optic. Please specify which one you want if only ordering one, both in mint condition. Seneca Driftwood Juice Tumblers, 6 oz. 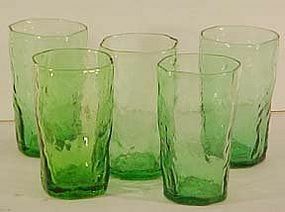 in green were made in the 1960's and match the Morgantown pattern "Krinkle". 4" tall, 5 are available and all in excellent condition. 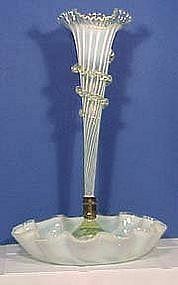 Stevens & Williams Vaseline Opalescent Epergne stands 13" tall, made in the 1880's! The base is 8" wide. 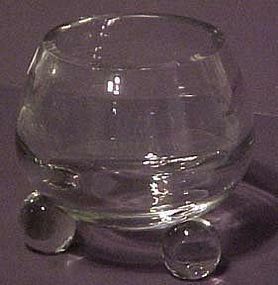 Has a couple of very small bubbles within the bowl. Otherwise, it has no chips. Excellent condition for something made in the 1880's. 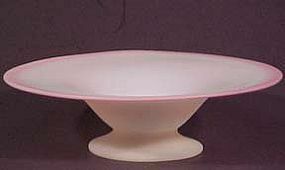 The bowl is swirl optic while the horn stem is heavily ribbed. Any questions, please ask. 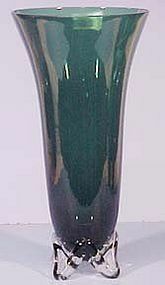 Tiffin Bud Vase, Oneida etching is 11" tall and in mint condition. 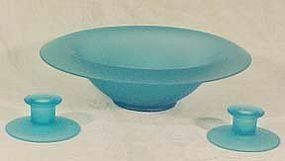 Tiffin made this blue satin console (3-piece) set in the 1920's -- 2 low candlesticks and a rolled 12" bowl. All in excellent condition. Tiffin Ball Stemmed Copen Blue Vase stands 7.5 inches tall and is 5 inches at the top. It was made in the 1950's and is in excellent condition. 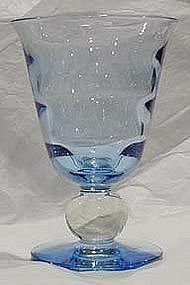 Tiffin Crystal 7" Vase with circular optic. Is in mint condition. Made in the 1950's. 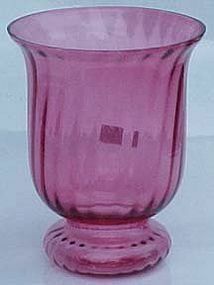 Tiffin made the etching Fuschia from 1936-40. 4 are available. 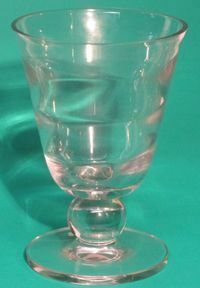 7.5" tall water goblets, all in mint condition. 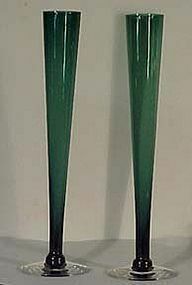 Tiffin produced the color Kilarney Green in the late 1940's through the 1950's. 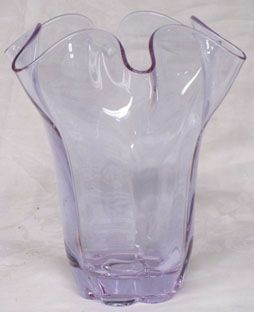 This 11.5" vase is in excellent condition. This Tiffin compote stands just over 4" tall and is 5" across at the top. 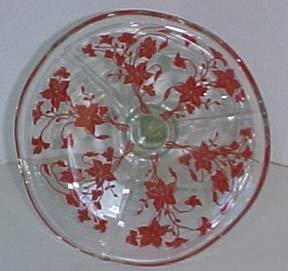 The etching is Oneida, produced in the 1930's. It is in mint condition. This Tiffin red encrusted compote was produce in the 1930's with the Oneida etching. Red encrustation is very hard to find. This one is in mint condition, stands about 6.25" tall. 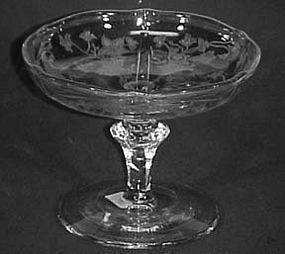 Tiffin Crystal Ring Optic 3-Footed Rose Bowl measures 5" tall and about 5.5" at its widest. Excellent quality of crystal, no chips or scratches.